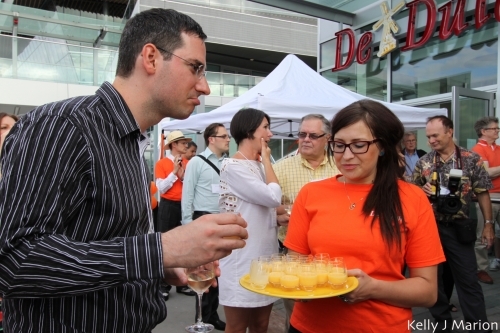 Friends and family of the De Dutch team as well as media and local businesses and suppliers gathered together Monday night to celebrate the new De Dutch restaurant on the seawall. The evening was abundant with music, munchies and mimosas as old friends reconnected and new connections were made. "Boogie Woogie Swing Jazz" Pianist Dominik Heins played for the guests as they sampled food and toured the new restaurant. 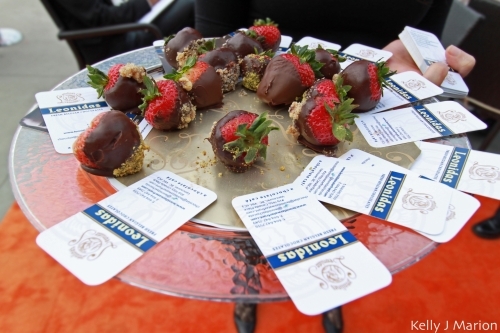 They also partnered with nearby restaurants such as Leonidas to offer desserts for the evening including melt in your mouth chocolates and scrumptious Belgian chocolate covered strawberries. Despite the event being about the launch of their new restaurant, it wasn't solely a sampling of their food, and rather a night jam packed with Dutch influenced activities. 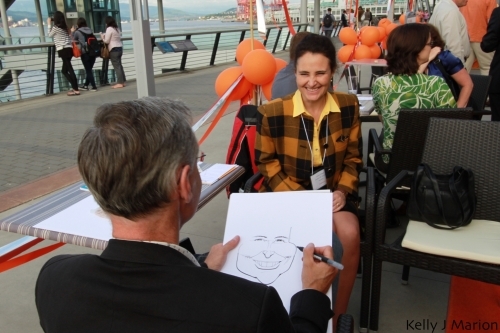 Jesse van Muylwijck, a well known Dutch Caricature artist from the Comox Valley, made a special trip over for the event to draw those guests who wished to have caricature portraits. 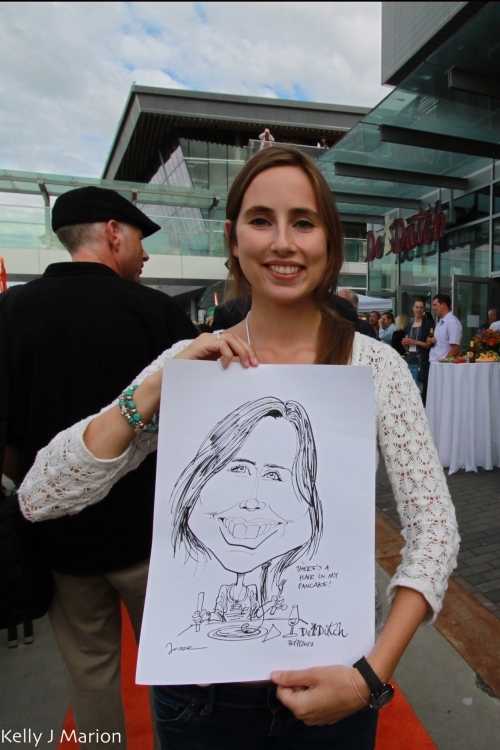 Many were enticed by the idea and pleasantly surprised with the fairly accurate and humorous drawings. 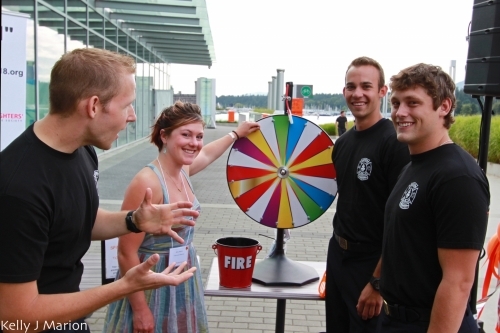 There was also an opportunity to spin the prize wheel with the handsome junior firemen (in the one year probation period) in an effort to raise funds for the Vancouver Fire Fighters Charitable Society. 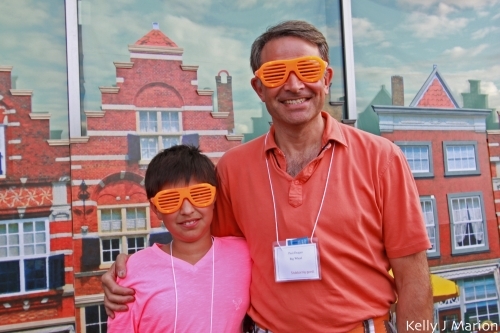 Prizes such as water bottles, Dutch flag scarves and these crazy "Dutch orange" sunglasses worn by the Maximillian and Paul Dragan were an example of gifts that were won. 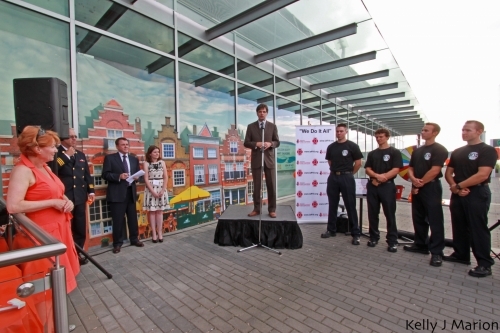 There was also an opportunity for speeches by Walt Judas, VP of Marketing for Tourism of Vancouver (shown below) and Joe Foster, Assistant Fire Chief Operations. 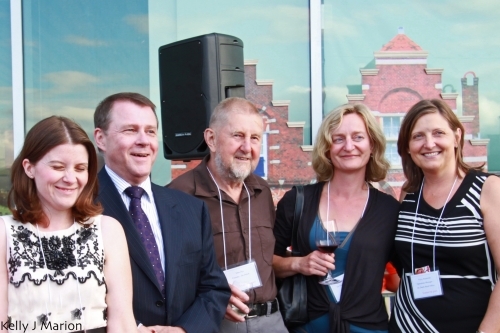 To honor the Dutch and in celebration of the new location for De Dutch the crowd gathered together for a collective "Proost". 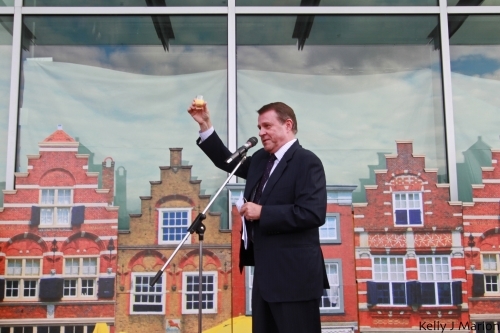 The drink was a traditional Dutch beverage called the advocaat which is basically a spiked egg nog. 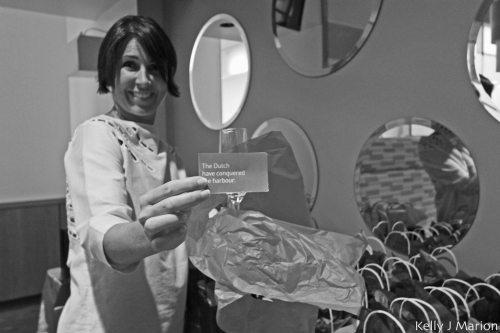 The new De Dutch location on Burrard Landing on the Seawall is great representation of their new brand identity. While they feel that each of their restaurants have their own vibe, the new location is more modern and elegant in a way, designed to suit the prime location with its spectacular view. The menu will stay consistent with food items ranging from sandwiches, wraps, salads, burgers and Dutch toasties to their infamous Dutch pannekoeken. The new restaurant is licensed so will be perfect for a morning mimosa or a speciality coffee as you watch passerbys as you look out towards Stanley Park. 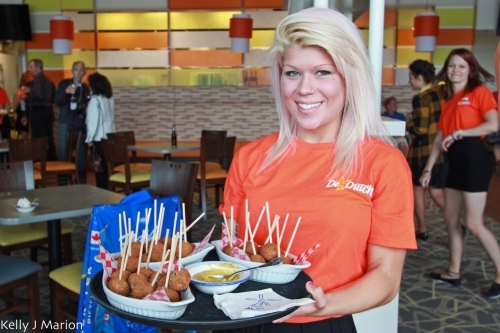 You'll also notice that the team at De Dutch pays attention to details. Evidence is on the table in front of you with their china plates, and their freshly cut flowers on each table beside the bottle of real Canadian maple syrup and traditionally made stroop. They pride themselves in the little things, just as they pride themselves in being "Stubbornly Goed". Stubbornly because true to their ancestor's stereotype they refuse to compromise, whether it's on the fresh ingredients they use or paying attention to details. 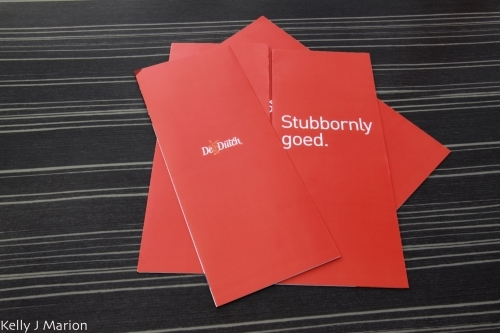 Goed because it's the Dutch word for good; simple as that. 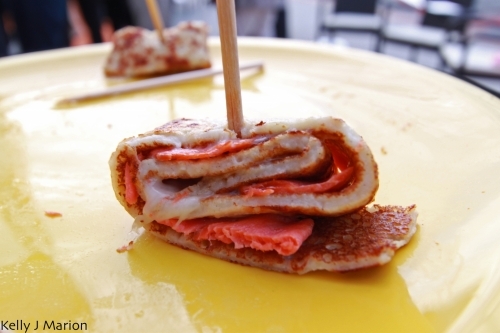 I'll be visiting De Dutch's new location soon and already have my eye on the apple and cheddar with stroop pannekoek and the Windmill pannekoek, with shaved wild bc salmon, edam and hollandaise sauce. For more photos from the event check out my set on Flickr.